Michael Jackson's This Is It: the title says it all. It's the King of Pop's last hurrah. He proves that even in death he can still charm, belt out the most heartbreaking and poignantly hopeful songs, and dance his pants off. Precious: Based on the Novel Push by Sapphire: A few weeks ago Sapphire appeared on "The Mo'Nique Show" with the cast of Precious and revealed that "Precious" is actually a composite of several people Sapphire had met during her life. That could be why many of us who've seen Precious can relate to her as we struggle through great obstacles in our own lives. No, we may not all be overweight, welfare-dependant teenage moms who've suffered through years of abuse. But we all know what it feels to be be knocked down and told we weren't good enough. 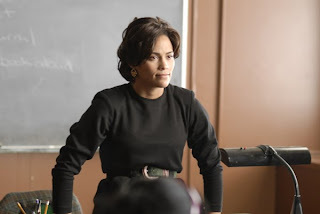 Filled with gripping performances by a knockout cast led by Gabourey Sidibe Mo'Nique and Paula Patton, it's no wonder why Precious has been leading the pack of pre-Oscar award rumblings. Skin: An interesting story of a young girl's struggle to fit in a society she was pushed out of but so desired to be a part of. Sophie Okenedo flawlessly portrays the older version of Sandra Laing, who was born to white Afrikaan parents but whose skin was mysteriously darker than theirs. As a result, she experienced a whole other level of racism in apartheid Africa. Funny People: This is Adam Sandler's dark but hilarious story of a man who faced death and turned to comedy for the cure. This is now my favorite Adam Sandler movie. Watchmen: This is one of the few action movies that actually had a pretty good story. It didn't have a a bunch of A-listers. It didn't have over-the-top special effects. It was just a a really cool movie. Away We Go: I'll call this the grown-up Juno. Maya Rudolph and John Krasinski are adorable as the expecting parents who travel far and wide to find the perfect home for their unborn child. It's surprisingly touching, funny and very understated. Surveillance: This movie keeps you guessing until the very end. The surprising twists and turns will keep you squirming in your chair as you follow two detectives as they uncover one of the murkiest murders ever to hit their small town. The Hangover: I'm still laughing at this movie and I saw it months ago! How is that possible? Bradley Cooper steps out as a leading man in this brash comedy about a group of guys who take a Vegas bachelor trip and....they're still trying to piece together what happened after that roofie. They take the audience along with them as they stumble to fill in the blanks of their wild night of intoxication. This was one of the funniest comedies I've seen in a while. State of Play: This is the second film in stage two of Ben Affleck's acting career, the stage where he actually redeemed himself as an actor (the first role being Hollywoodland). Affleck plays the squeaky clean politician whose reputation gets put on the line when he becomes the target of a murder investigation involving his mistress. Russell Crowe is also great in this movie as the shady lead detective in the investigation. State of Play keeps your interest even as the credits roll. The Soloist: I'm a little surprised this movie hasn't garnered more pre-Oscar buzz. Dear Academy: Even though it debuted in theaters in the first half of the year, please don't rule this one out. Both Jamie Foxx and Robert Downey Jr. are amazing in this movie as they from the unlikely friendship of two lost souls who help find each other in the midst of their turmoil. American Violet: Another movie I think has been unjustly shut out of award season talk. Newcomer Nicole Beharie is engaging as a young mother of four who's wrongly accused of drug dealing in a small town in Texas. Her pride, her children and her hope for justice all gets raked through the mud in this moving story. Revolutionary Road: You can tell I really like a movie if I see more than once in the theaters. Kate Winslet was absolutely stunning in this role of a dejected housewife in need of some serious jumper cables to regain her hope for life again. Leonardo DiCaprio is also captivating as her businessman husband who's just trying to get a handle on his wife, his career and his own life as it all comes crashing down in this 50s-inspired flick. The Wrestler: Mickey Rourke made his grand return to leading man status with this role after an eight-year hiatus from Hollywood, and it was worth the wait. Raw, emotional and depressing at times, The Wrestler was the true story of a comeback kid. Disclaimer: 2009 is not over yet! And I haven't ruled out the upcoming Oscar hopefuls debuting in December. Stay tuned for additions to this list. What's your favorite movie of 2009? So great to see State of Play, Funny People and This Is It on your list, Candice. Loved those movies this year! Definitely agree with you on Watchmen. As a pure cinematic experience, it was incredibly exhilarating. I really want to see Skin. I've seen the trailer a couple of times and the story seems so compelling. Watchmen was really good.. And I had a great time watching the hangover..